If you are a homeschool mom you’ve probably already discovered that there will be times when your kids complain about doing school work. Maybe they only complain on occasion because you are a homeschool rock star and make every lesson impressively engaging. On the flip side, maybe your kids complain every. single. day when it’s time to begin school. It could be one subject that causes all the whining (hello, math!) or they could simply complain about every little thing. Do you have a complainer in your homeschool? So then, are you in despair, thinking that somehow you as the homeschool teacher are the blame? Or maybe you’ve blamed the curriculum, or the schedule, or the subject matter? It might just possibly be the child. (Of course, it can be any combination of all these reasons). Step out from under the weight of all that guilt and know that sometimes kids will complain about homeschooling. Why? Quite simply, because learning can be challenging. Admit it. You’ve complained about difficult tasks. Your kids will too. You’ve researched curriculum, spent hours planning, ordered books, prepared notebooks, set up a work space, and started your homeschool year. Just a few days in to the year you have students threatening to mutiny and you’re wondering where you went wrong. We wonder what happened to our adorable, eager little scholars. Before you stress about attitudes and how to reclaim the joy in learning, know that we are all fighting the same battle. We’ve all had to face-off with little people who stubbornly refuse to do school or who have a personal mission to make everyone dislike the school day as much as they do. This isn’t failure on your part. Your homeschool dreams have not gone up in smoke before your very eyes. 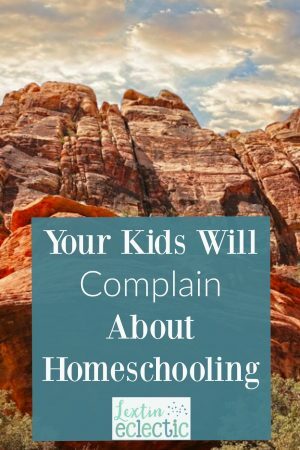 There will probably be lots of complaining during your homeschooling days. This ugly little truth is a secret of many homeschool moms. We silently bear the frustrations of our kids while feeling guilty that somehow we are the cause. There are things you can do to try to combat some of the complaining. However, embrace the reality that there will be complaints, bad attitudes, whining, tears, arguing, and frustration in the homeschool journey. Learning is a challenging process. Give your kids some grace. And give yourself just as much grace; you are learning too! Allow them to voice their complaints at designated times – Teach them to voice their complaints in a respectful way and make sure that you set aside time to actively listen to their struggles. Screaming, whining, and tantrums are not allowed but respectful discussion is always acceptable. Allow them to talk about their frustrations and discouragement. Share with them the times that you feel less than enthusiastic about homeschooling. Have weekly meetings to discuss school with them – Sit down with your kids weekly or monthly and have a time to evaluate their progress, but from their perspective. What are their challenges, their struggles, and their biggest accomplishments? Allow each child to brainstorm ways that school time can be more productive, more fun, and less stressful. Give your kids the time to share their input. Let them start making choices about subjects, curriculum, and schedules – As they are older, allow them to choose one elective per year or per semester. For younger kids, give them little choices during the school day such as the order that subjects are completed or where they want to work on their homework. Find ways that they can make choices about their own education and what they are learning. Give them more responsibility – Some kids might need to work more independently or have more responsibility for their own education. They may be a complainer because they feel they should have more input into the decisions surrounding their education or they might prefer to do more subjects without your direct oversight. It’s important to recognize when kids need some independent learning opportunities. Utilize outside classes for accountability – Sometimes kids might do better answering to someone other than mom for a change. I’ve found that an outside class on occasion gives my kids a new perspective. When they answer to someone other than me they realize that deadlines are universal and that learning expectations might even be higher. My kids do sometimes need a break from me and they are often more motivated when working on classes taught by someone other than me for a change of pace. Empathize with them – The most important response is to empathize with their struggles. It’s true, I don’t have many memories of my hard-fought battle with phonics in 3rd grade or my struggles with math in 5th grade. However, I do know that there were many times that learning felt overwhelming and like an impossible task. Make it a point to be sympathetic and encouraging. My kids do complain about homeschooling sometimes. It’s important that I don’t take their gripe sessions personally. Most of the time, the heart of their complaint is simply about the difficulty in learning something new or facing a new challenge that seems overwhelming at first. When I change my perspective on their whining I can remind them to voice their frustrations in a respectful way and they know that I will listen and empathize while giving them the space to brainstorm ways to address and overcome their frustrations. It’s ok that your kids complain about homeschool. But when they do complain, take the time to truly listen and then find ways to give them the responsibility for solving the problem themselves. And if all else fails, don’t be afraid to impose some limits. I do hear lots of whining and complaining in my homeschool. This is one resource that I highly recommend to help you put a stop to all the complaining and know how to respond to the bad attitudes. Implementing some of these strategies has made a huge difference in our homeschool! This was so timely! I'm immediately going to implement some of these suggestions. Thank you for sharing.